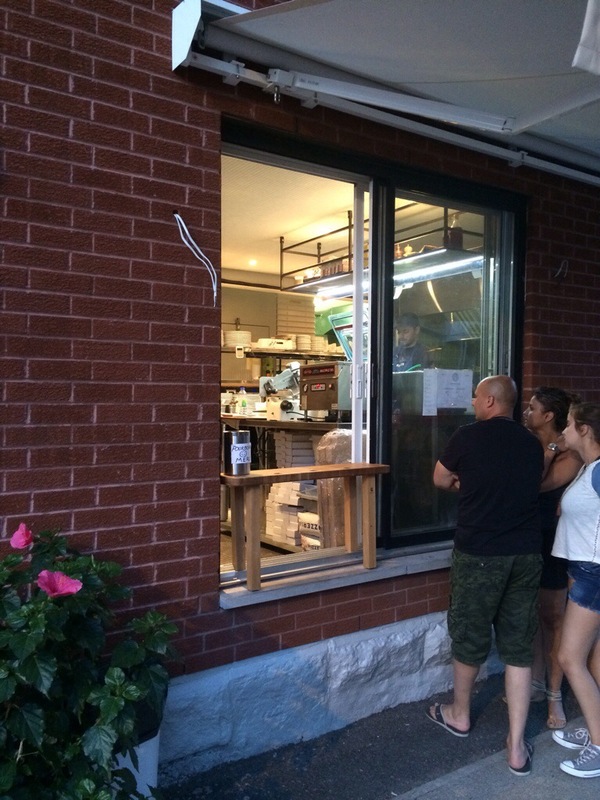 We have been spoiled in Montreal recently with all the great pizzerias that have opened up. The flip side of having such great pizza readily available is that pizzerias must work that much harder to keep our interests. Average pizza just won’t cut it anymore. 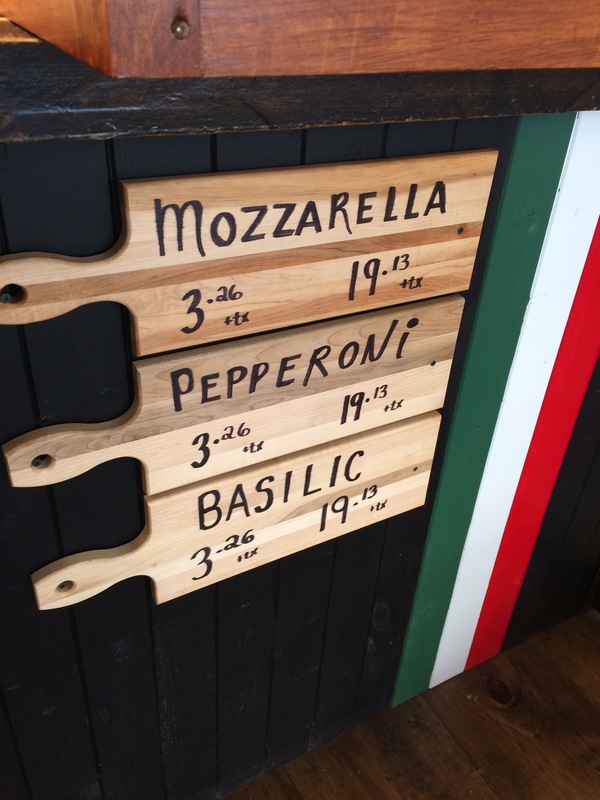 Last week, I found myself in Westmount at Bacaro Urban Pizzeria – for the record, we need to kill the adding of “Urban” to things that don’t need it but I digress – ready to enjoy a pizza and see how they stacked up to my favorites. It was dead on the weeknight we were there – only one other table was occupied – so the ambience was non-existant. 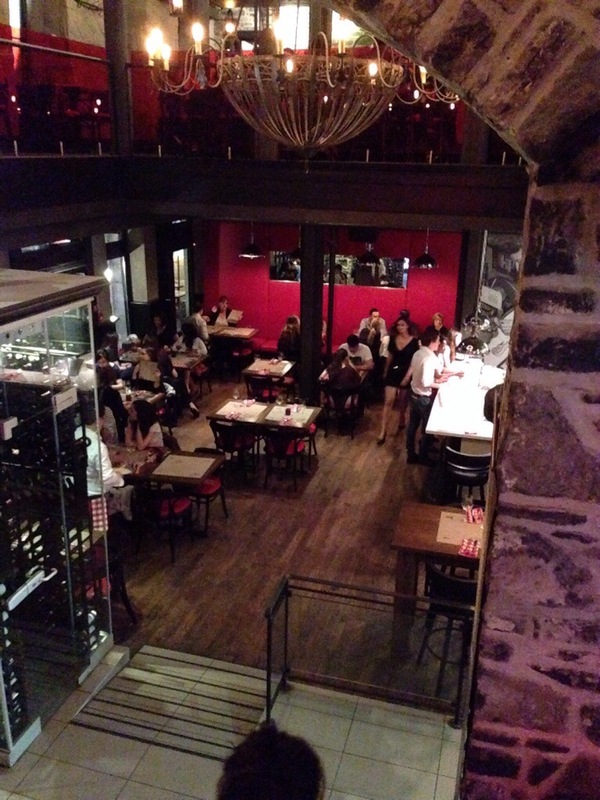 The room is nice though – very clean and modern with touches of a more classic Italian pizzeria. I liked the use of old Italian sports newspaper as wallpaper and the painted murals of some of their suppliers. There is also a bar at the entrance with a entire shelf of large Nutella jars – once I saw their dessert list, I understood why! We kept it short and sweet on this evening so I got to try a couple of pizzas. My selection was the Polpetta – meatballs, ricotta and basil. The pizza had a good size – very filling for one person. The amount of toppings was plentiful although I would have loved more basil personally. I loved the combination of the meatballs with the creamy ricotta. My issue was with the crust however. 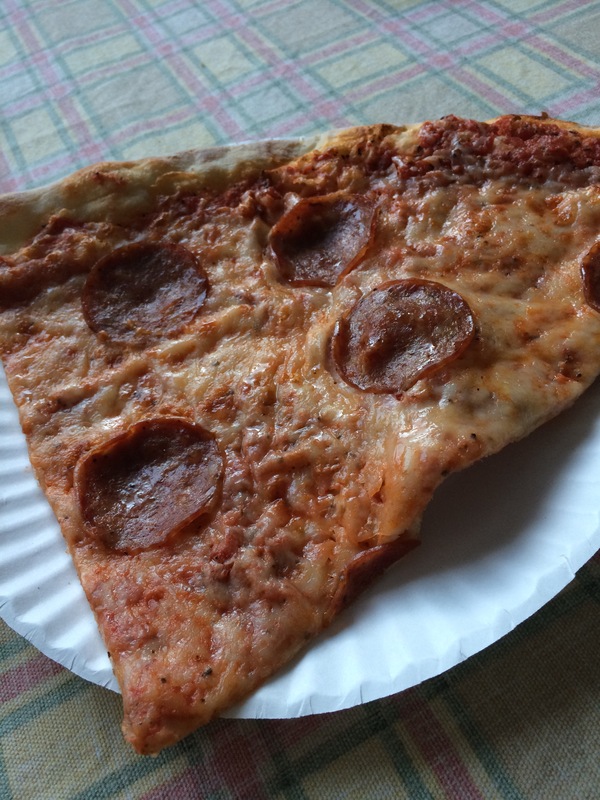 While the picture does show a nice char on the top, the underside was too soft – there was no crunch and the pizza could not be lifting at all without it collapsing on itself. 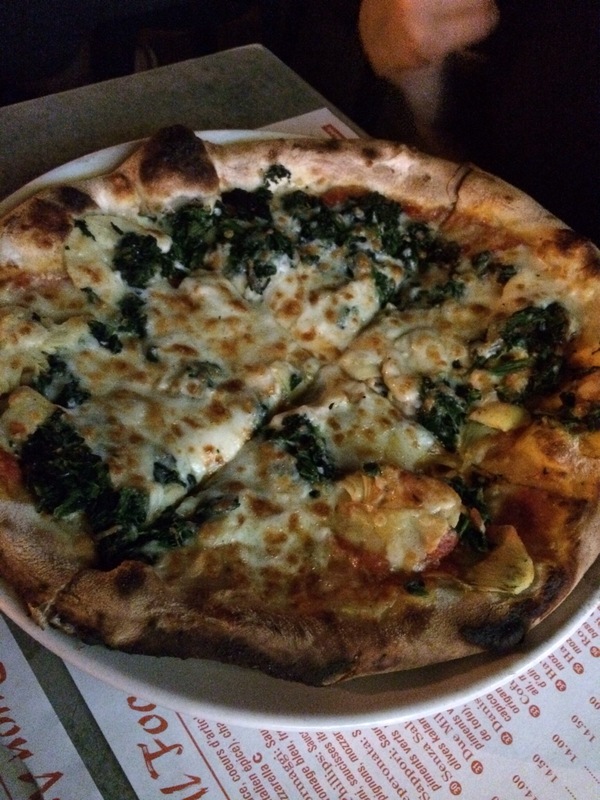 The pizza was very flavourful but with a thin crust pizza, you need a solid crust and that was lacking. It was a similar story with my girlfriend’s pizza, the Quasi Norma – eggplants, zucchinis, red peppers and ricotta. Tons of fresh veggies, the right amount of cheese and sauce but the underside was just too limp and soft. We did have time for dessert though – especially when we saw how much Nutella was involved. We decided to share the Nutella cream cake – sliced panettone layered with nutella cream served with nutella sauce. If you love Nutella then this is your cake. Good lord was this rich and decadent. I expected the panettone to be harder in texture but frankly it was better this way. A great way to cap off the evening. Bacaro had high standards to meet for me and didn’t quite get there. 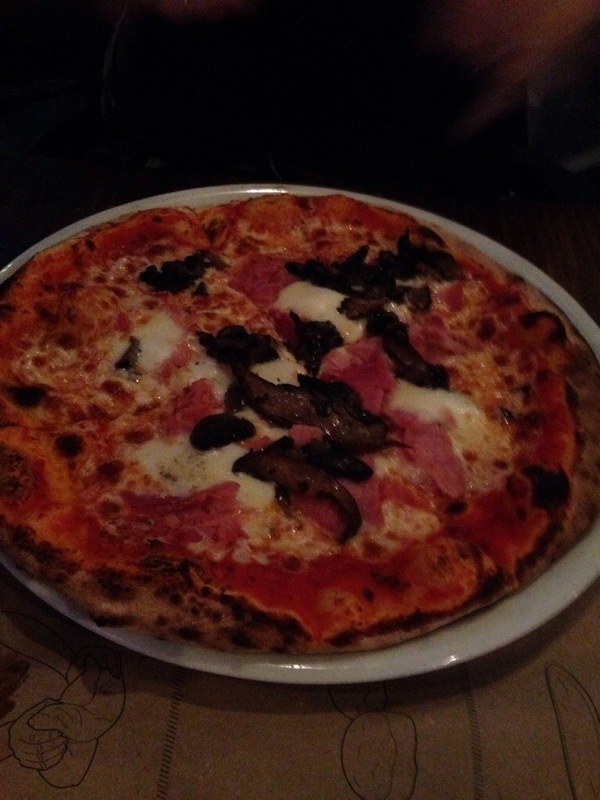 The flavours were there all around and the service was nice and friendly but if the crust is lacking, then the pizza just can’t hold up for me. 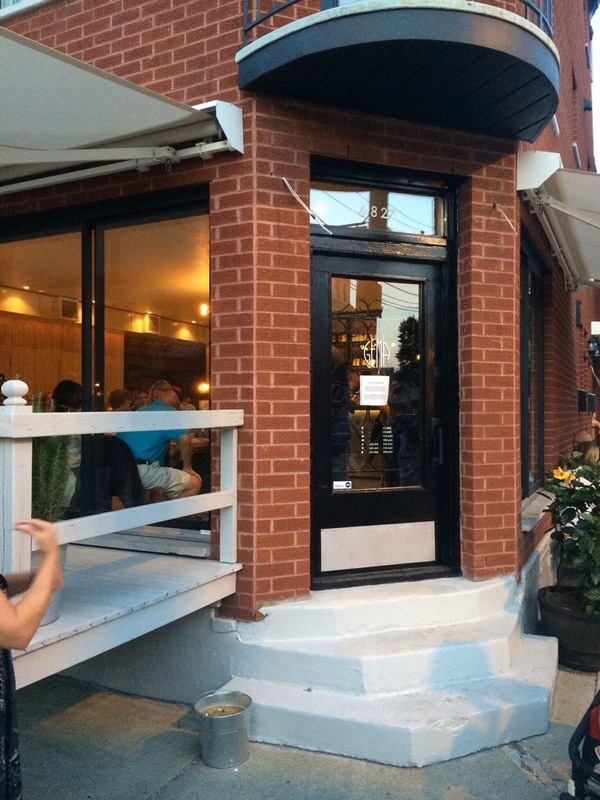 If the crunch appears, we have a winner but until then, Bacaro can’t quite reach my upper echelon of pizzerias. After a great experience at GEMA (see my previous post for that rundown), I got another hankering for a pizza the following weekend. I got some friends together and planned to head back for a second try when I discovered that they were closed for summer vacation. Darn….. well we still had a desire for pizza, so where to go? 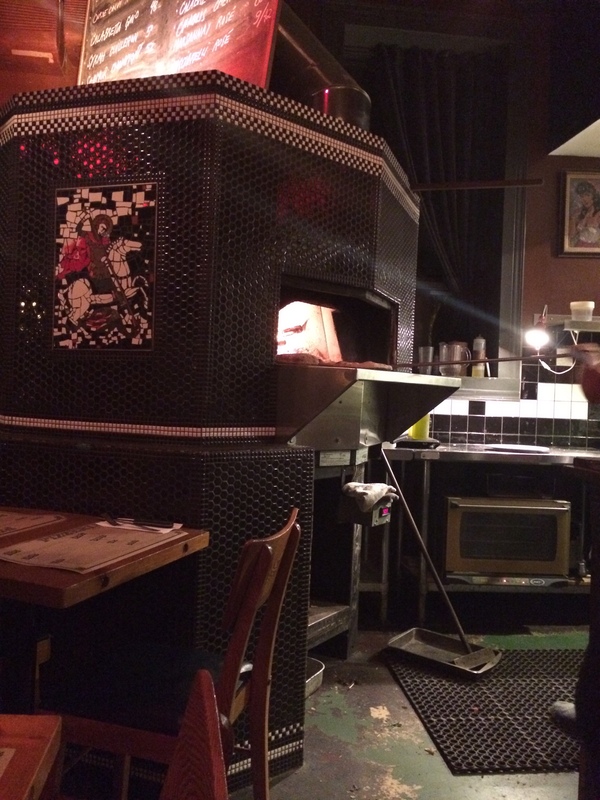 Thinking about places nearby, I had a flash and remembered Pizzeria Magpie, located across the street from Chez Serge bar in Mile End. One of those places I have had on my never-ending list for a while but kept forgetting about. We drove up hoping they had room for 4 on a Saturday night and luckily for us, they did. First thing I noticed walking in was the overall look and vibe. A small intimate space overall with the open window in the front to give a little terrasse feel, low lighting, a beautiful dark bar on the side, the blackboard menus and the ceramic-tiled pizza oven visible to all – Magpie gives off a relaxed cafe/bar feel but with enough intimacy to be a solid date place and enough “edge” to be a cool place to bring friends for a happy hour or late evening meal. Loved it completely – this place goes on the possible date locations list (whenever the heck that ever happens again… but that’s a story for another day). For starters, we grabbed some of their cocktails to get the evening started. My friends selected the Pimm’s Cup and the Magpie Caesar. 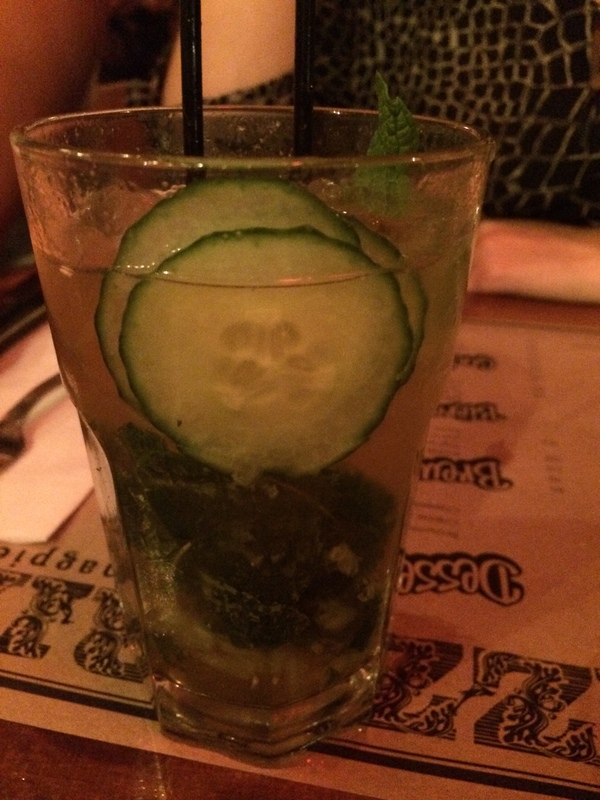 The Pimm’s Cup, served with some mint and cucumber, had exactly the kind of citrus and spice flavours you look for. Very refreshing. 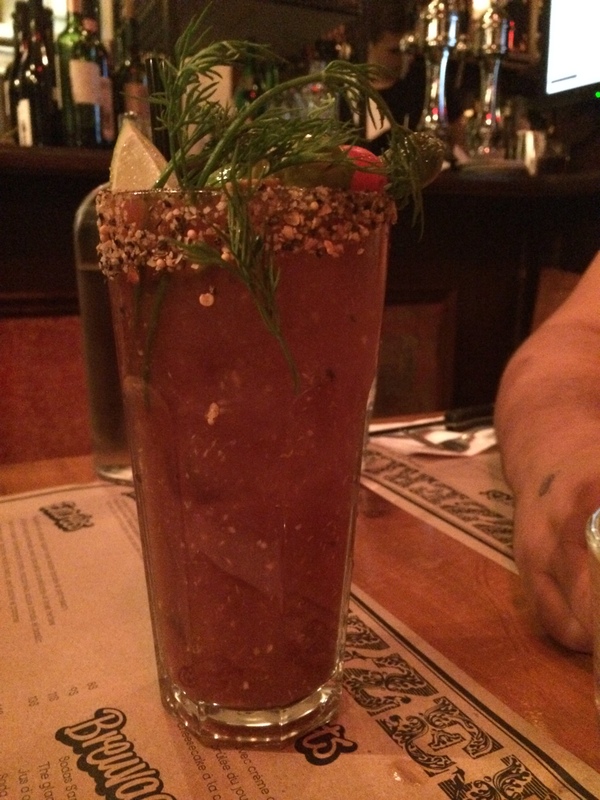 As for the Caesar, it certainly looked impressive – especially with the steak spice used on the lip of the glass, however I hate Caesars (yes… another thing to add to the list) so I didn’t try it. My friend certainly enjoyed it though. 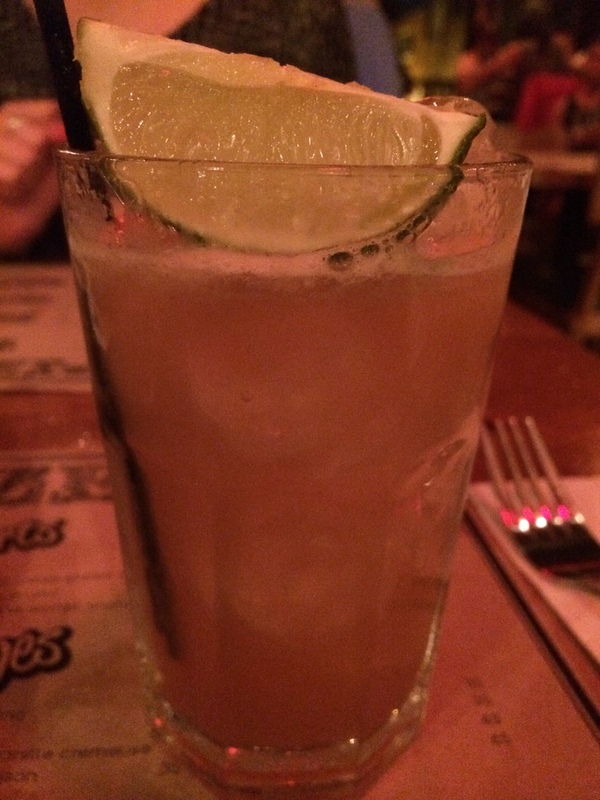 In my case, I went for the Dark and Stormy – dark spiced rum mixed with the house made ginger soda. Very nice balance between the sweet rum and the ginger. 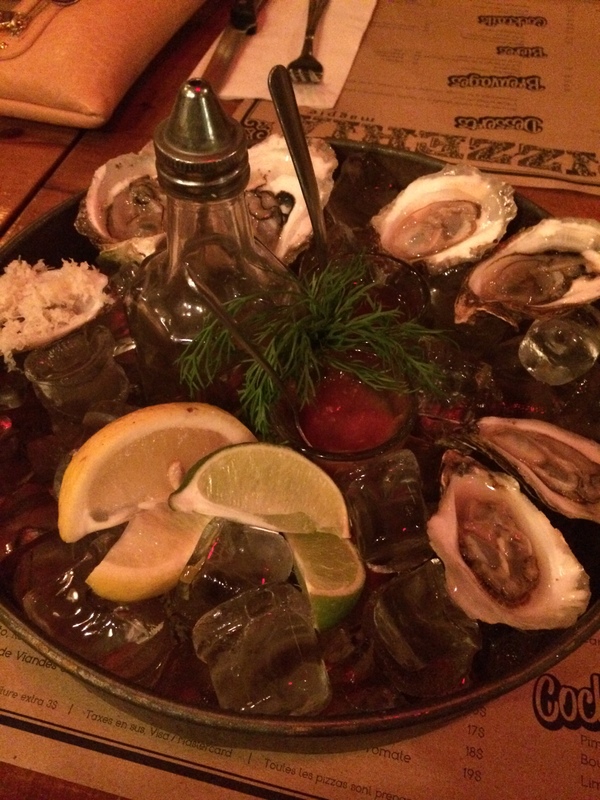 Before the pizzas came, I just had to order some oysters. On this evening, Magpie had 3 varieties – Conway Royals, Gooseberry Bay and Tresor and I asked for the mix of all three. Served with fresh horseradish, lemon and lime wedges, a mignonette and some hot sauce, the oysters were all of good size and shucked perfectly. Nice start to the meal. Anyway, the first one up was the special of the day – a gravlax pizza with onions, tomatoes and dill. 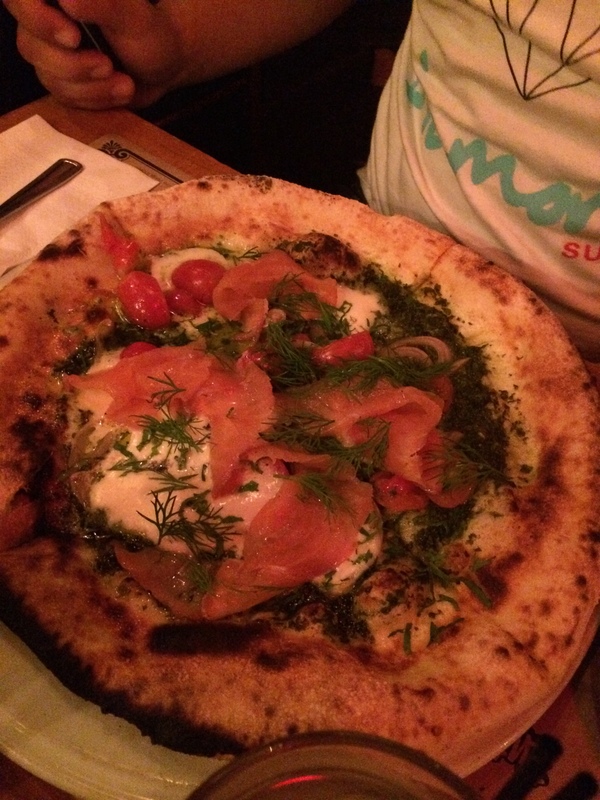 A very creative option – the gravlax itself was delicious and quite plentiful on the pizza. The fresh dill, tomatoes and onions work well with gravlax normally so of course it would work on a pizza. Loved the overall quantity of topping as well. An excellent out-of-box option which in my opinion is worth keeping around as a regular option. Next up was the goat cheese pizza with pancetta, arugula, basil and tomato sauce. Due to photographer error, I don’t have a picture of this one to share but regardless you get the picture anyway. Great combination of the creamy goat cheese with the salty rich pancetta to elevate this one past the traditional Margherita. Excellent pizza. 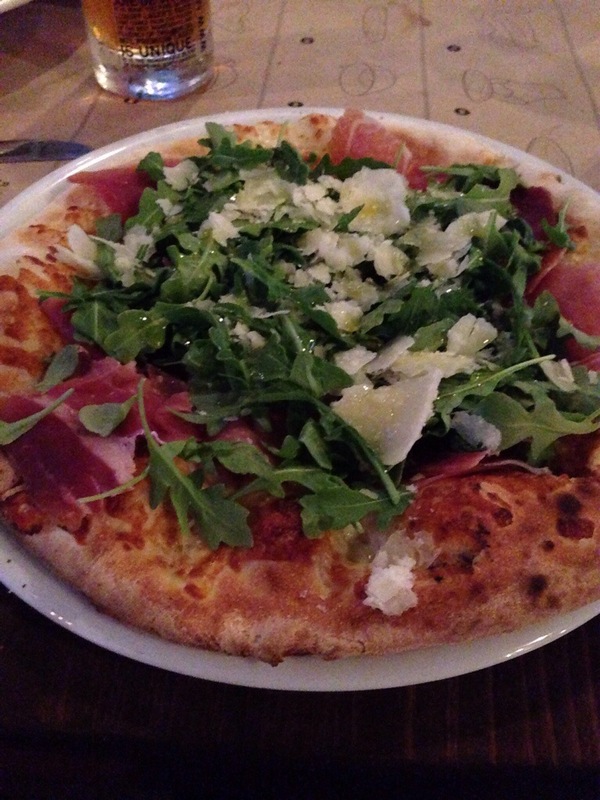 The third one was the prosciutto pizza with arugula, cherry tomatoes, bocconcini and tomato sauce. 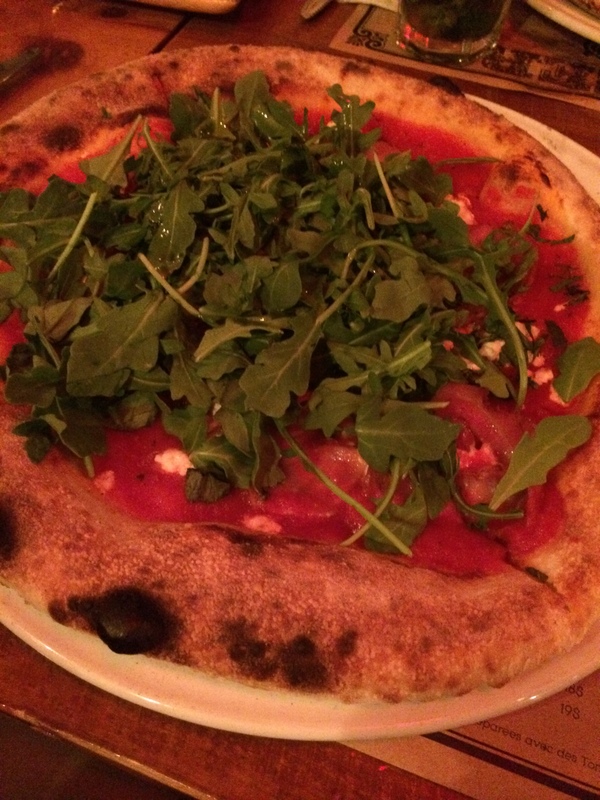 Another solid pizza – any pizza with prosciutto is good by me – although personally I felt that there was way too much arugula over top of this pizza which kinda made it overly peppered. The final pizza was the Bianca – with roasted garlic, spicy capicollo, cherry tomatoes, bocconcini and herbs. This is one spicy pizza – a little too much for my liking personally. I was quite surprised at just how much the capicollo overpowered everything else on this pizza. I also would have enjoyed a bit more cheese on this one. Good but my least favourite of the four easily. 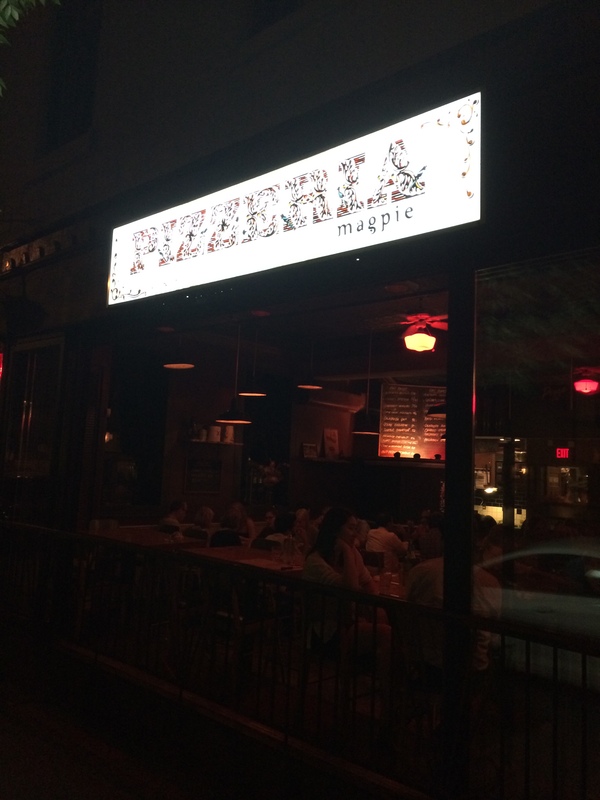 Pizzeria Magpie is a solid entry in the Montreal pizza scene – and by far the best in Mile End in my eyes. The cocktail and oyster combo with the relaxed and intimate atmosphere make it a perfect place for a quick bite or drink before a larger meal – and that is without taking the pizzas into consideration. They also do weekend brunch now which intrigues me tremendously. Not my first choice for a pizza but close enough – both in quality and in location – for me to definitely be back in the near future. Ever since Stefano Faita and Michele Forgione of Impasto announced their second project would be a pizzeria, I have been eagerly anticipating its opening. The level of craft showed from them at Impasto left me no doubts that their approach of pizza would worth the wait. Each instagram post from Chef Forgione of his test runs made me more and more excited as we saw the level of perfectionism in its purest form. This pizza would be no slouch. Finally, at long last, I could find out for myself. Pizzeria Gema opened up last month just across the street from Impasto in the heart of Little Italy making the corner of Dante and St-Dominique an happening culinary corner. Gema itself is a relatively small restaurant – all of about 40 seats probably and they don’t take reservations, so you may have to wait to get in. In our case, we waited about 30 minutes. The nice part is that they will take your phone number down and call you so you can go from a walk or grab a drink elsewhere in the meantime. If you prefer, there is a takeout window on the side where you order a pizza to-go or some frozen custard. The interior is sparse but clean – old wood panels on the wall, aged hardwood on the floors with a weird light “tree” in the middle of the room adding some color to the space. 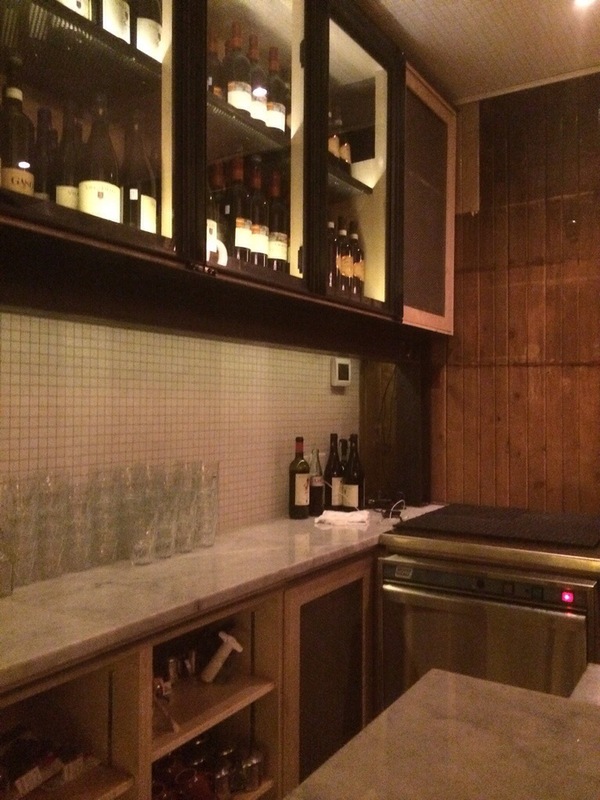 The other focus point is the bar with its marble countertop although I got a good laugh that the bar chairs are the same Ikea ones I have in my apartment. The space isn’t a looker like its neighbour Impasto but that’s not an issue for me. The menu is small and concise. A few entrees, 8 or so pizza options and some frozen custard for dessert. 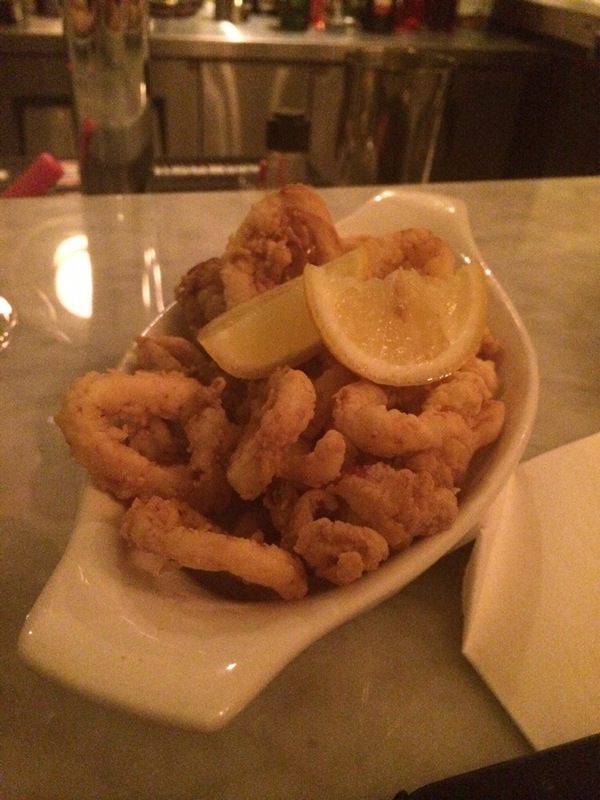 As a starter, we went with the fried calamari. A nice portion of fresh calamari with a good crunch to them. They are served with a couple of lemon wedges, no mayo because they don’t need any sauce to enhance flavour. The calamari have plenty of flavours all by themselves. On the pizza side, we got 2 pizzas to enjoy. 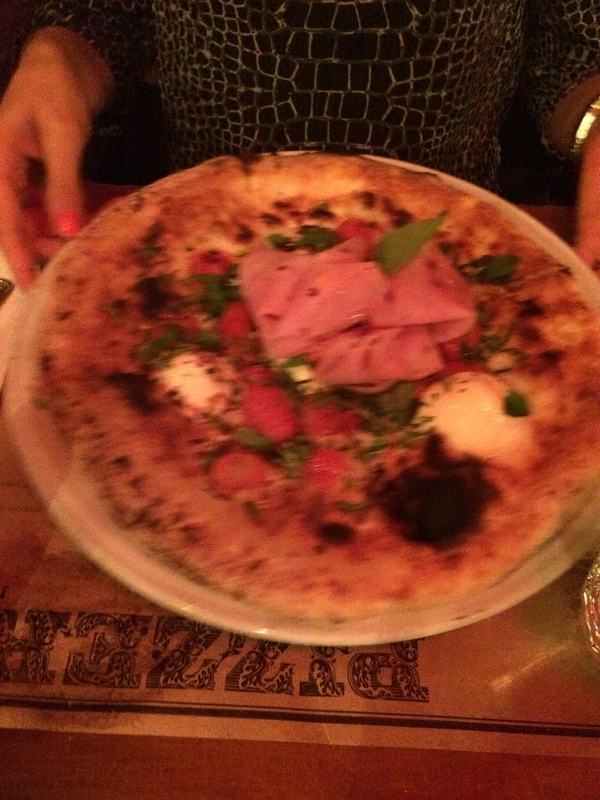 The first one was their basic “1889” margarita pizza with tomato sauce, fior di latte and fresh basil. The second one, because I am a huge meat-lovers fan, was the Giovanni Deluxe – tomato sauce, zampina, pepperoni, porchetta and lardo. 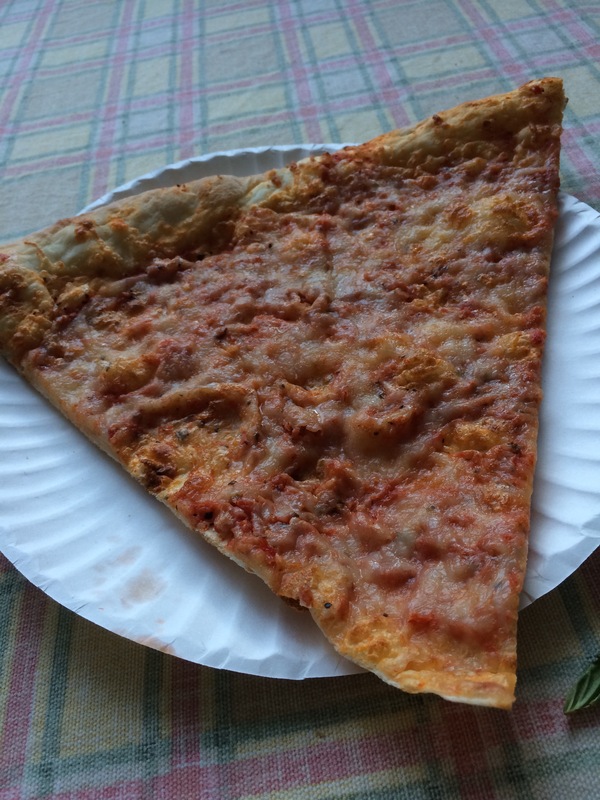 Boy, did these pizzas not disappoint…. the pizza crust is just insane. Ridiculous. Whatever positive superlative you want to use applies to this dough. A nice crisp seer on the exterior without a single burnt spot to be seen…. and completely soft and moist inside. This level of dough mastery deserves the highest praise. Props to you Chef. And we haven’t even gotten to the toppings yet. 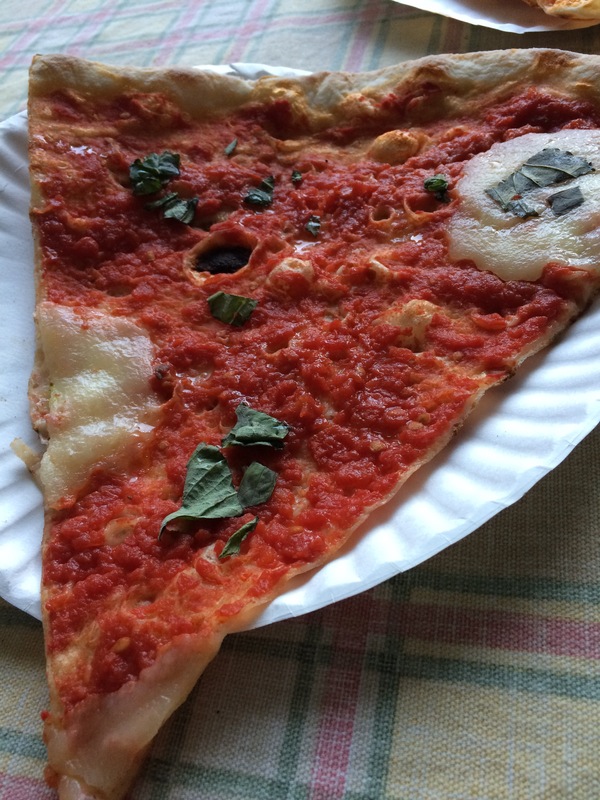 The classic margherita was excellent – the tomato sauce was tangy, the cheese creamy and rich, the basil brought that freshness and the overall ratio on the pizza was excellent – none of the ingredients were too present or not present enough. 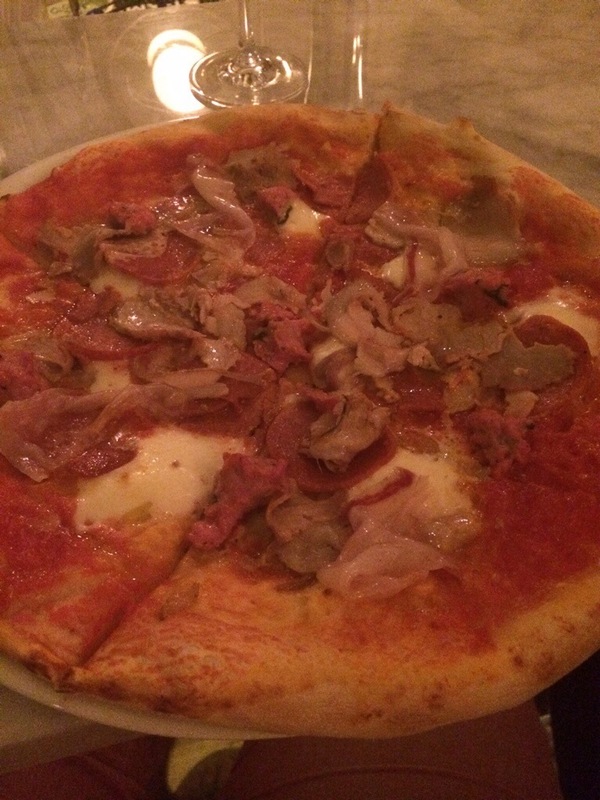 As for the Giovanni deluxe: house made pepperoni, the porchetta from Impasto, zampina, lardo…. this pizza had me from the description. Great combo of fatty rich meats on top of the base margherita. Simply heavenly. I just wished it had been bigger so I could enjoy it some more. Whatever you do however, make sure that you have room left for dessert because Gema has frozen custard… not ice cream but custard. The difference comes in terms of a richer, creamier texture which personally bought to mind a creamy version of Dairy Cream which hit childhood nostalgia for me every time. Gema has chocolate or vanilla so of course, we went with a twist of the two. 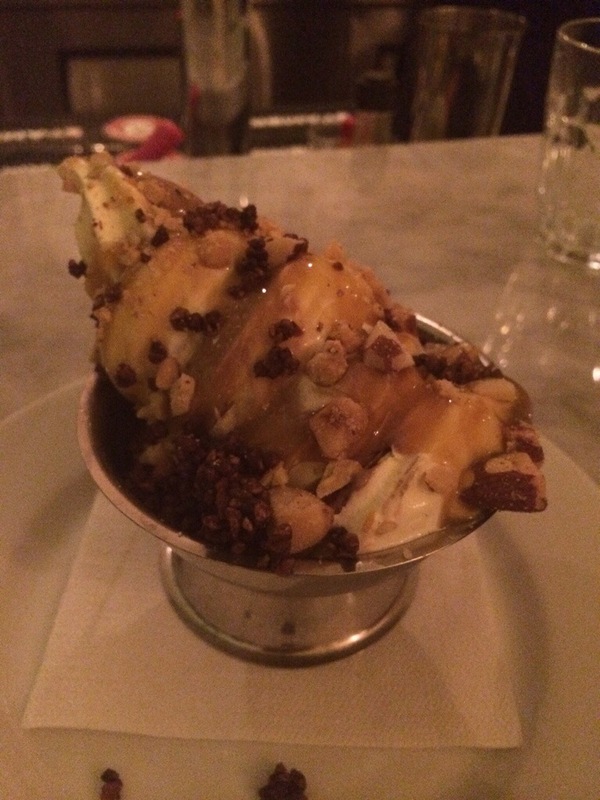 There is also a handful of topping options – we went with crumbled baci, mixed nuts and butterscotch sauce. 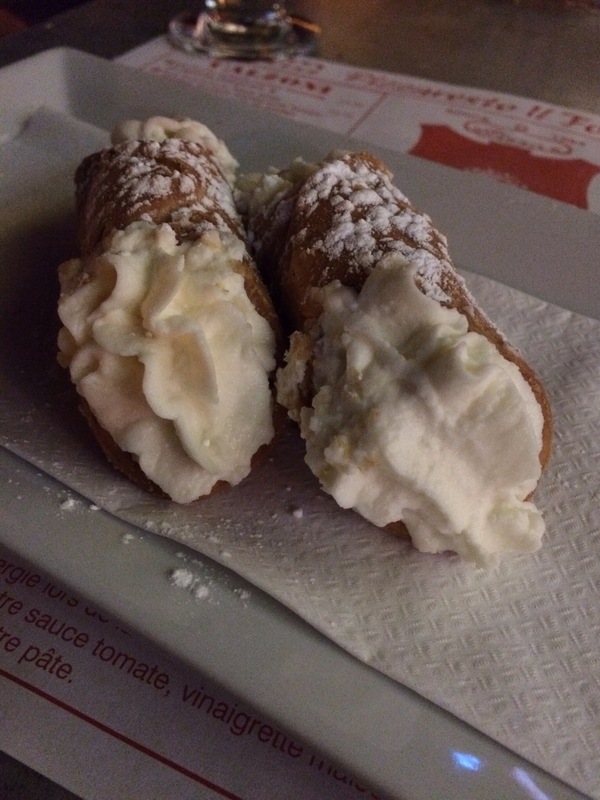 A perfect dessert for a pizzeria. Once again, Chefs Faita and Forgione hit it out of the park. 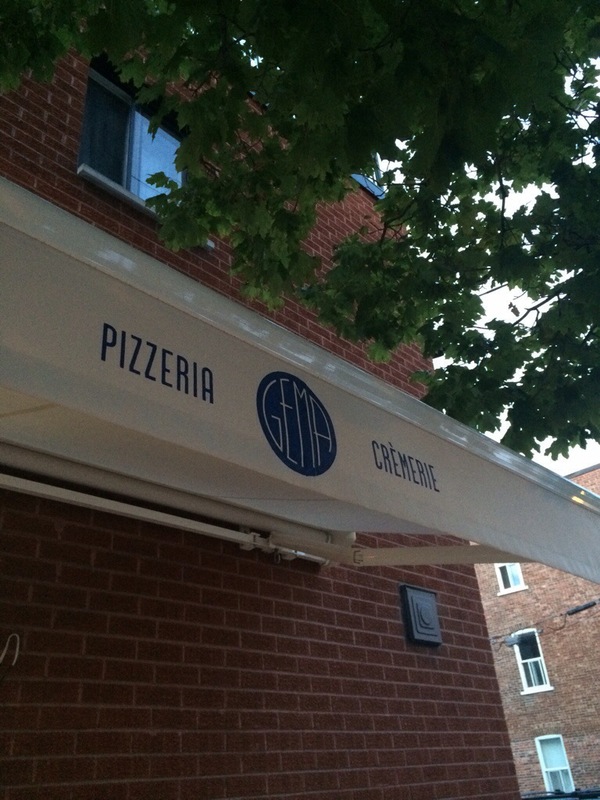 Gema is a wonderful addition to the pizza scene in Montreal and for me, is currently the champion hands down. That crust means business. If they offered delivery to the McGill Ghetto, I would seriously be a weekly caller. At present, I will definitely be a regular visitor because they are other topping combinations I need to try and that pizza is too good to pass up for too long. I like a good pizza. 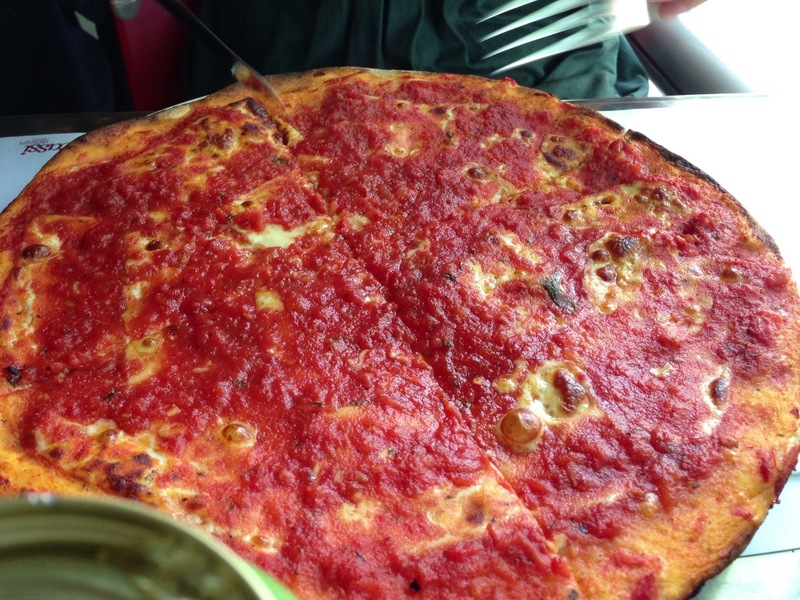 Scratch that – I love a good pizza. It has gotten to the point where I am experimenting at home making my own… and getting decent success as I keep working out the kinks. It’s not perfect but in the meantime, that is what good restaurants are for, am I right? 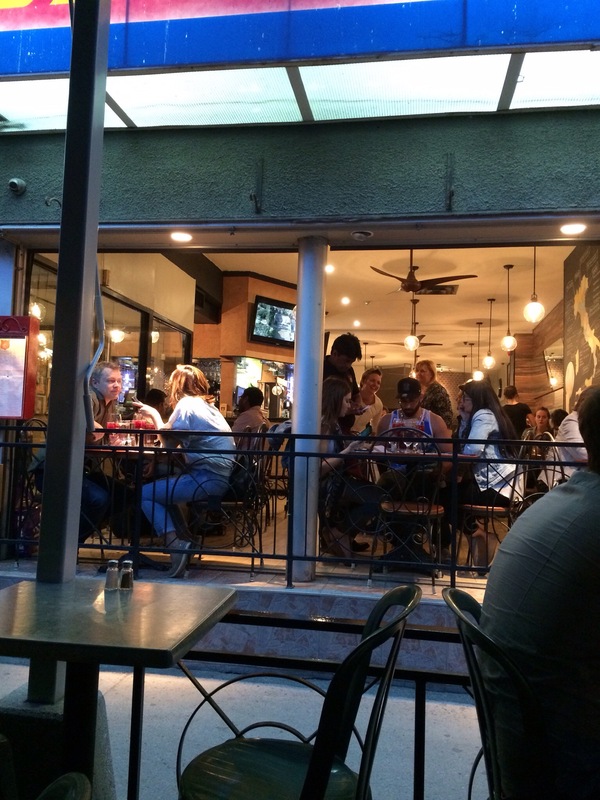 Last month, following a wonderful few hours at La Mondiale de la Biere enjoying many many brews, my friends and I got the hankering for some pizza. 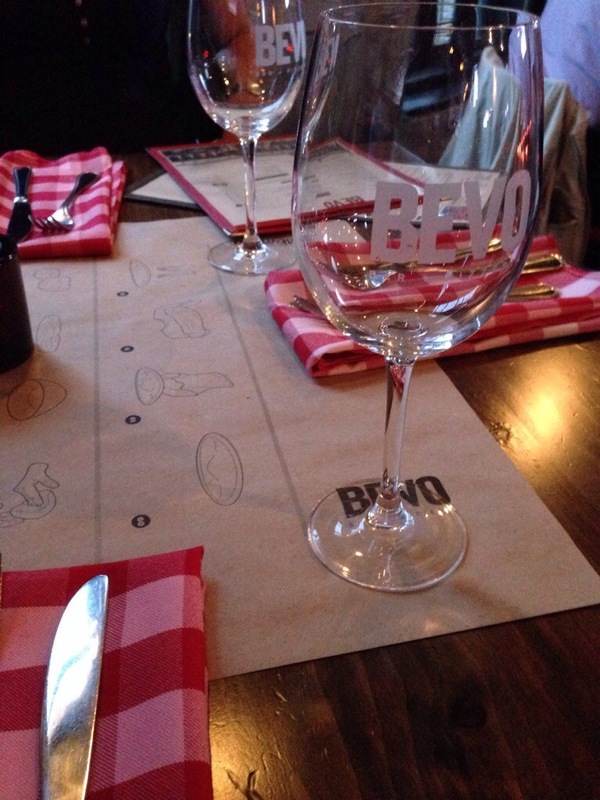 Thinking about the options closest to us, I figured a visit to BEVO in the old port was in order. So we casually walked over ready to enjoy some good Italian cuisine. 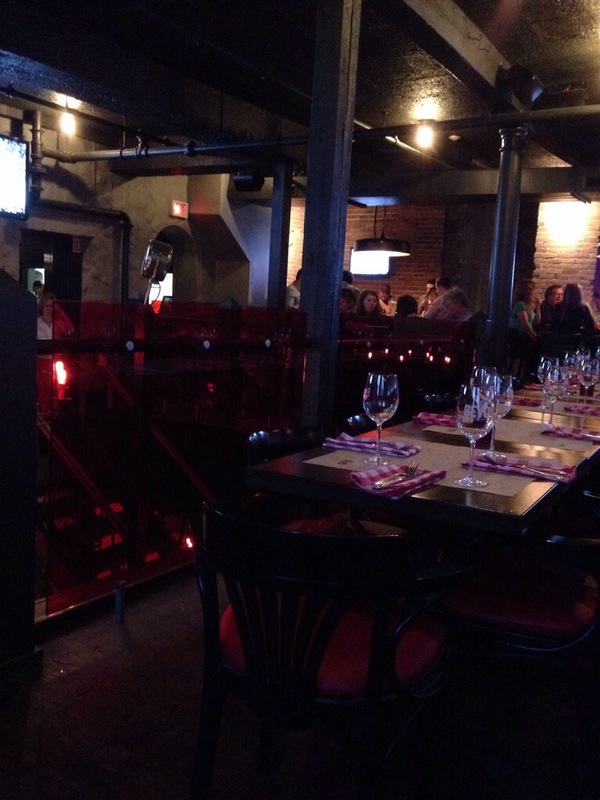 Located just off Place Jacques Cartier in the heart of the Old Port, BEVO visually is in keeping with many of the Old Port establishments – a mix of the old brick and stone foundations of the area buildings with some more modern elements to add some glam. In this case, BEVO uses red tinted glass around the atrium, a very large chandelier and an tile entry wait which includes a glass wine cellar. The first floor has a huge bar area where the backbar is lit up in red and the front of the actual bar is just a light box. Add an area where there are 70s-style hanging bubble chairs and you have a spot that is clearly a solid happy hour zone. On this occasion however, we were there too late for happy hour and too early for any late-night bar scene. 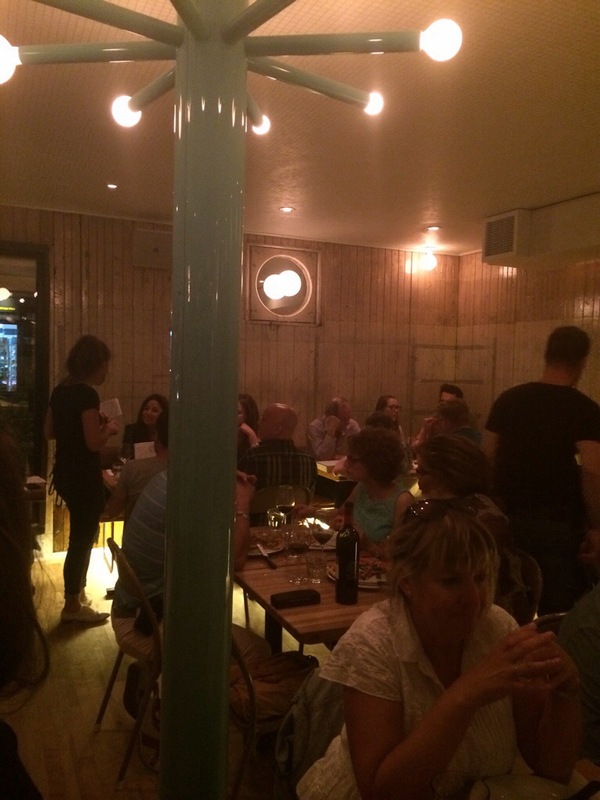 The two dining areas are more straight forward than the bar – wooden tables and chairs, paper tablecloths with cute info-graphics about pizza making and red checkered napkins for that little old school Italian restaurant touch. 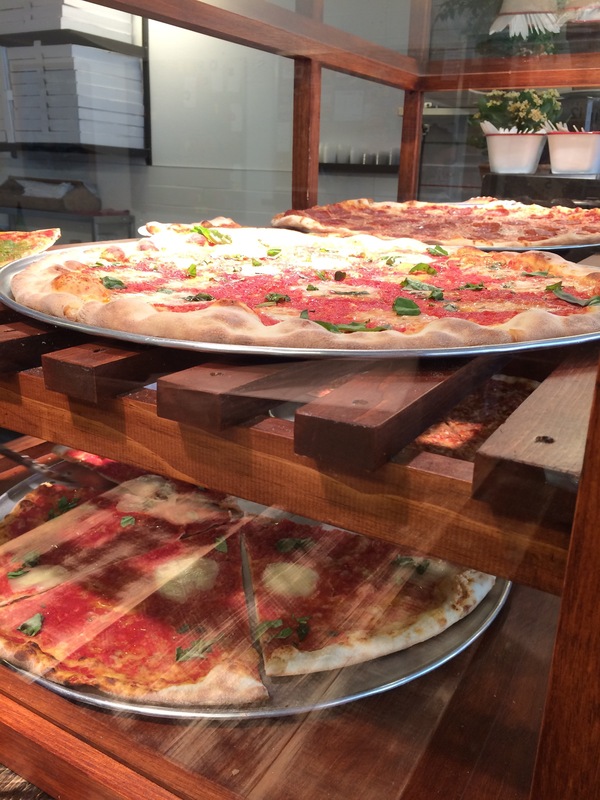 On the first floor, the wood-fired pizza oven is visible for all to see and gets you excited for what is to come. 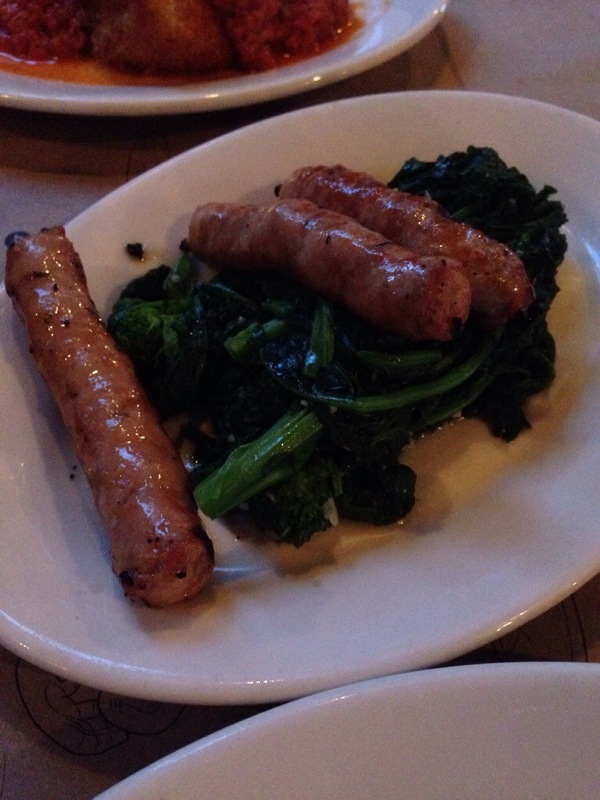 Our first starter was salsiccia e Rapini – a house made sausage with garlic rapini. The sausages were delicious although a little small for my liking. Rapini is one of those vegetables you either love or hate – personally I am a fan of its bitterness. The combination of bitter with the garlic made a nice partner to the fatty sausages. 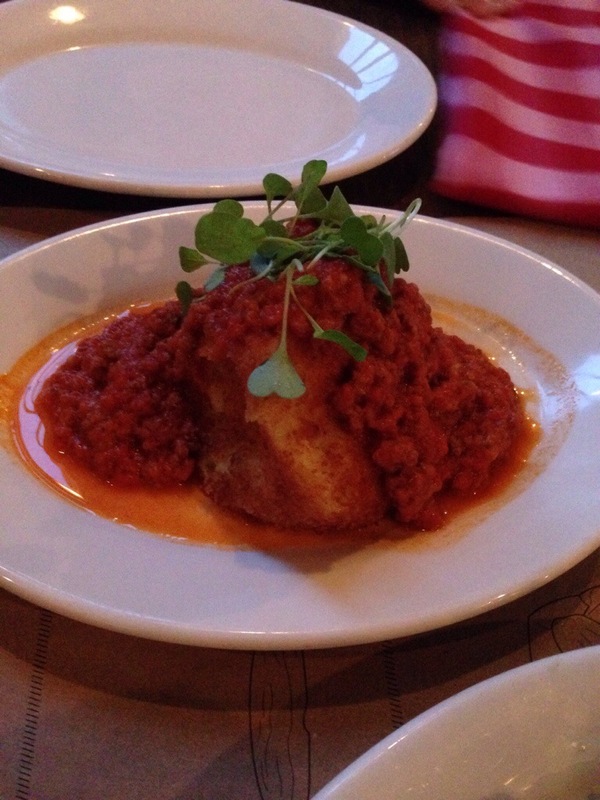 The second starter was arancino – saffron parmesan risotto balls with meat ragu and mozzarella. The risotto ball itself had a good crust to it and that didn’t come at the cost of drying out the risotto itself. It still had nice creaminess although I really didn’t get any hint of saffron personally. The meat ragu draped over it had a nice meaty richness to it and paired very well to the ball itself. Like the previous starter, I just wanted more! Because one of the friends with me doesn’t eat cheese (i know, i know…. i’ve tried to show him the error of his ways) we did order one non-pizza main dish: the cavatelli bolognese – dumplings, meat ragu and fresh parsley. 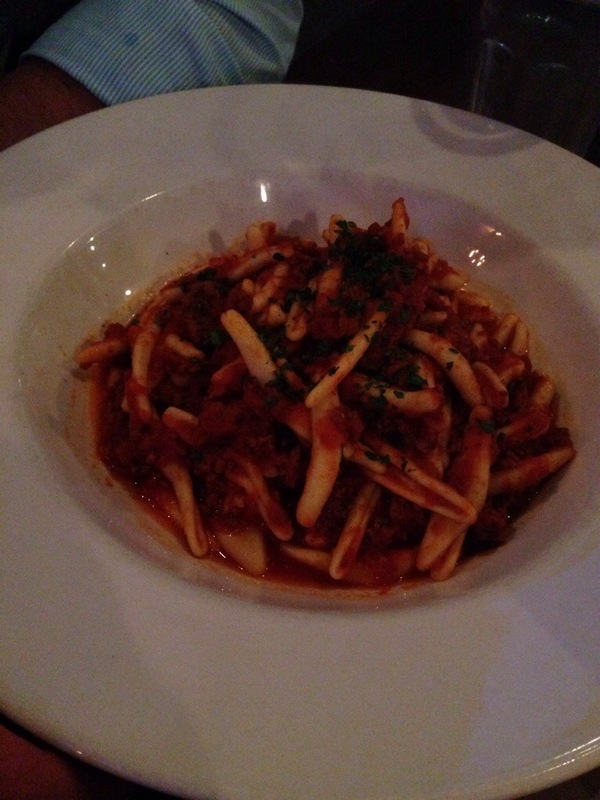 Excellent plate of pasta – same delicious meat ragu as before with the perfectly cooked cavatelli. A little bit of parmesan would have been nice but that was a lost battle from the start in this case. Now we arrive to the main attraction: the pizzas. 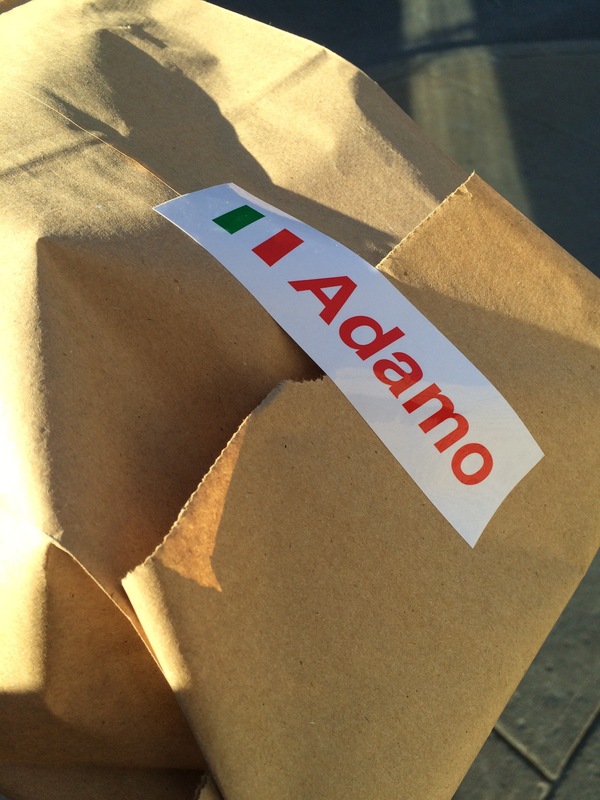 First up, I got the parma in blanco – prosciutto di parma, arugula and reggiano. This is probably my favourite pizza type when dealing with classic thin crust pizzas. The salty rich prosciutto, the pepper arugula, the sharp reggiano and a little bit of olive oil… a perfect balance of items on top of a pizza. However, all of that is wasted if the actual pizza isn’t up to snuff. BEVO doesn’t have that problem. The wood-fired oven gives a nice crispness to the bottom but allows for just enough rise to create some chewiness. A wonderful pizza. 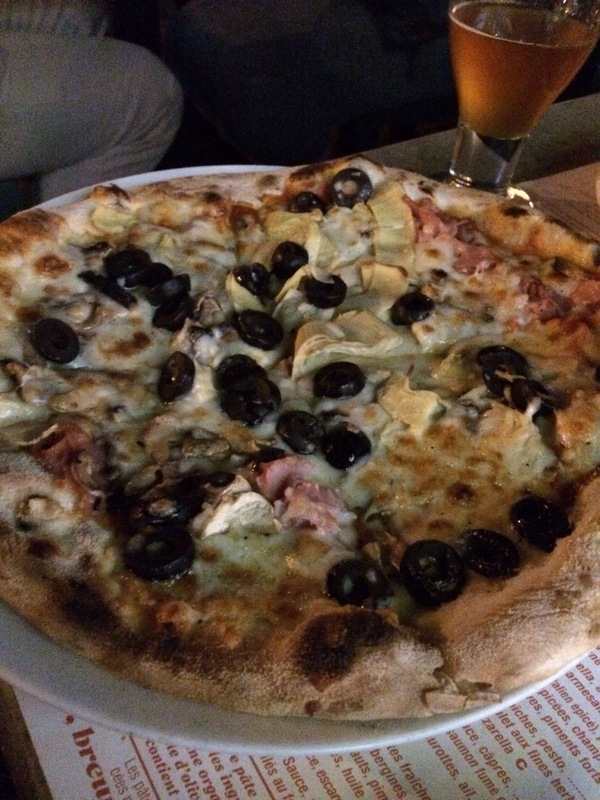 The other pizza we ordered was the cotto e bocconcini – prosciutto cotto, portobello, tomato sauce, mozzarella and bocconcini. Same solid crust as my pizza although this one had been cooked a little more as the extra charring around the edge demonstrated. The melted bocconcini brought some more creaminess compared to just the mozzarella and the earthy portobellos added some contrast from the prosciutto. Another excellent pizza. BEVO is a solid experience from beginning to end. 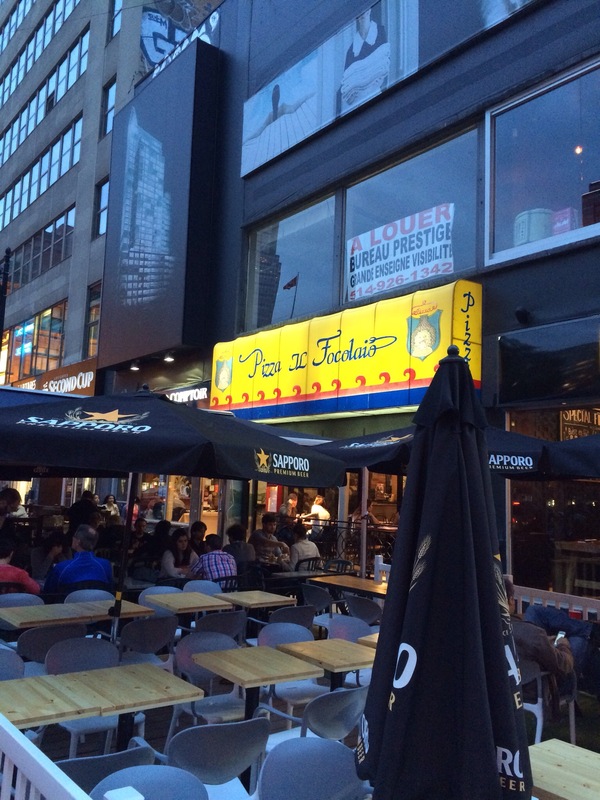 Solid starters, delicious pizzas and good pasta. All the beers from Beerfest prior eliminated our desire to test the cocktail and wine lists which seemed interesting. There was also the temptation of the nutella pizza for dessert but we decided to pass. Just gives me another reason to return. 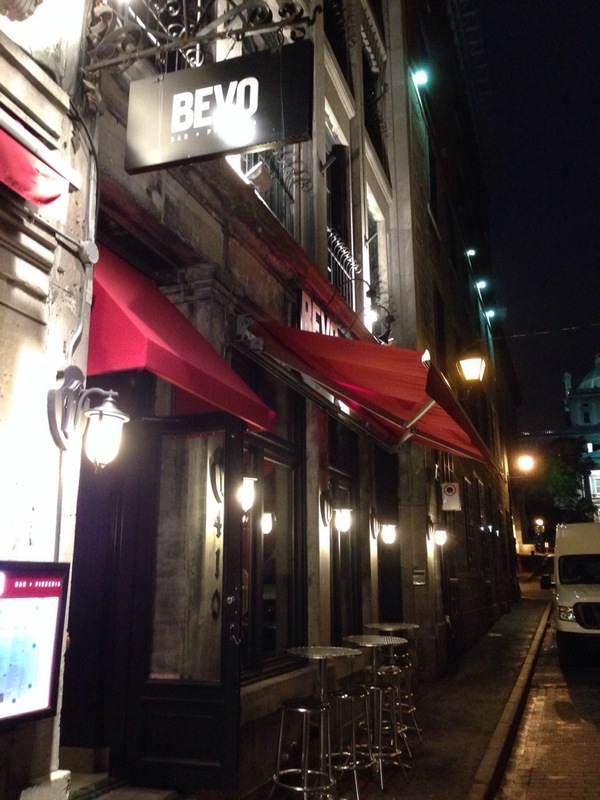 If you are looking for a good pizza in the Old Port or just a place to go enjoy a drink and a quick bit, BEVO is worth your consideration. If there is one blind spot in my Montreal food repertoire that I feel somewhat embarrassed about, it is Pizza. 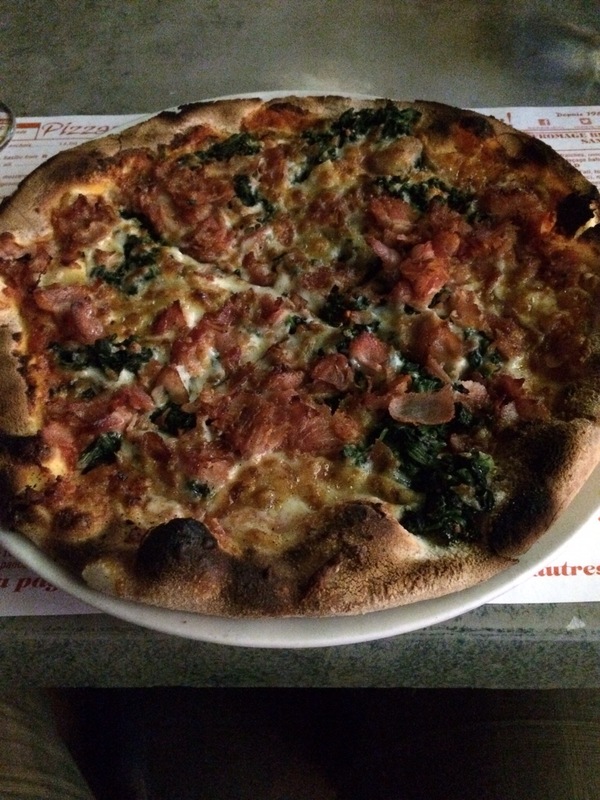 Despite my absolute love of all things Pizza related – I could honestly eat pizza everyday if such a thing were reasonable from a dietary point of view – I have not exploring many of Montreal’s fine establishments. If someone were to ask me where to get a great slice of pizza, I honestly wouldn’t have an answer that I could base on personal experience. Well… I want to change that. 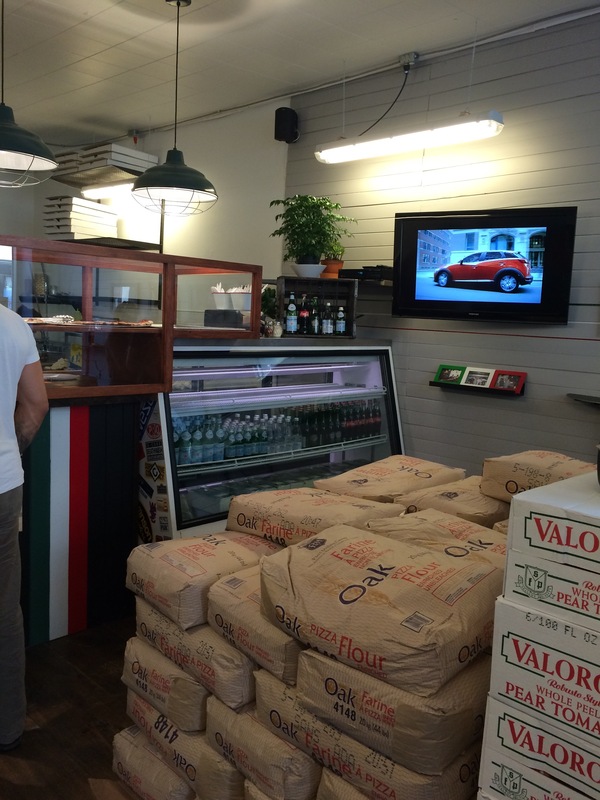 So last weekend, I took the opportunity after a visit to Jean Talon Market to try a Little Italy institution, Pizzeria Napoletana. Right off the bat, I am not a staunch advocate of either thin crust or deep dish pizza. I give equal time to both sides… as long as it is done right. In this instance, we would be treated to a classic Italian thin crust pizza. When coming to a place that has been doing it since 1948, one hopes you will be getting a great slice of pie. With thin crust, you are looking for a nice crisp base but one that still has a bit of chewiness to it. Too thin or crisp and you get something that tastes completely burnt. On the toppings front, you want a nice tomato sauce and good cheese. You want just enough of both to cover the dough but not so much that it overwhelms the flavor of the crust. I decided to go with a Quattro Fromaggi pizza for my first try. Before I add extra ingredients, I want to see if the basic pizza is done well. 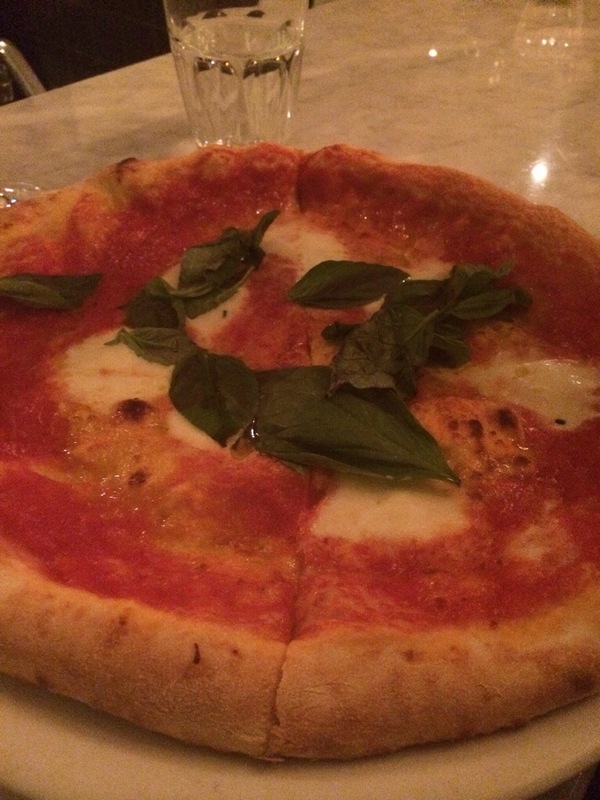 Napoletana uses Mozzarella, Parmesan, Romano and bocconcini for their version. This was a very well done pizza. It pretty much had everything I was looking for. Crispy yet tender crust – check. Bonus points for the slightly burnt edge as well. Right amount of both sauce and cheese – check. Tangy tomato sauce – check. Nice mix of cheese – check. Very satisfying pizza overall. 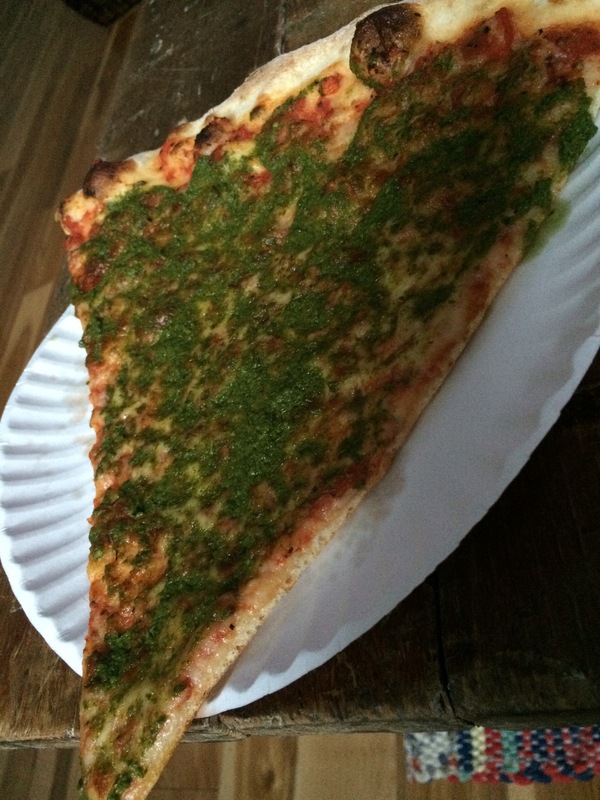 My sister went with a even simpler pizza on her end – the classic Margarita. Once again, a very nice pizza with the same characteristics of the previous one minus the added notes of the Romano and bocconcini cheese. 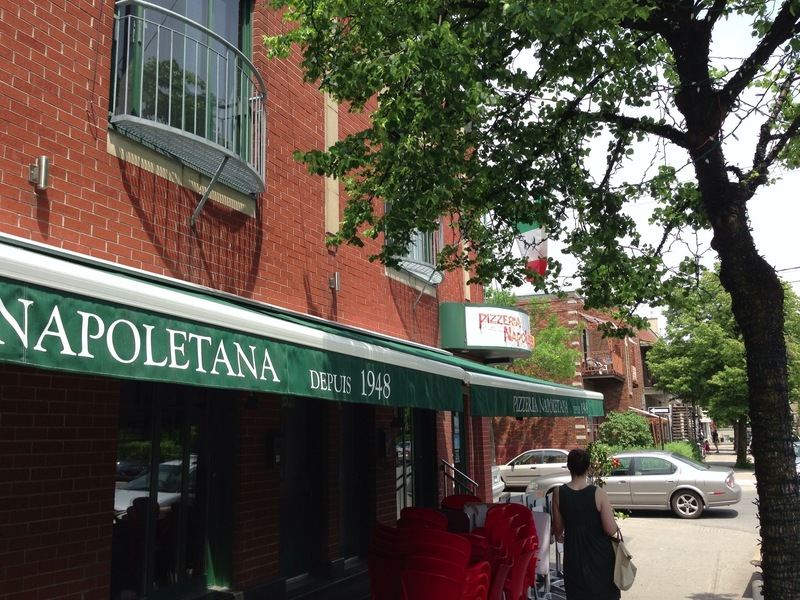 As the 1st true entry in the Montreal Pizza search, Pizzeria Napoletana was exactly what I expected from a Montreal Institution – a place that serves solid pizza, tried and true. 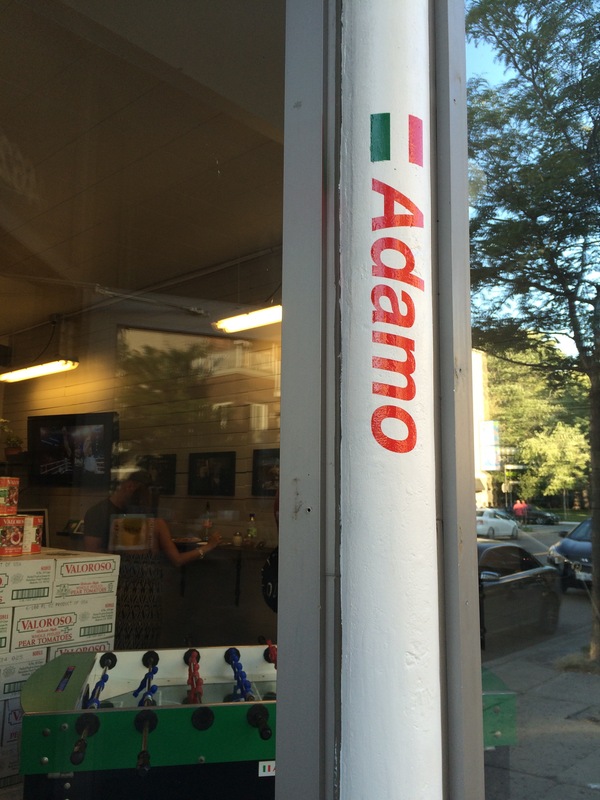 It was a good initial benchmark to set my expectations for a good Montreal Pizza. 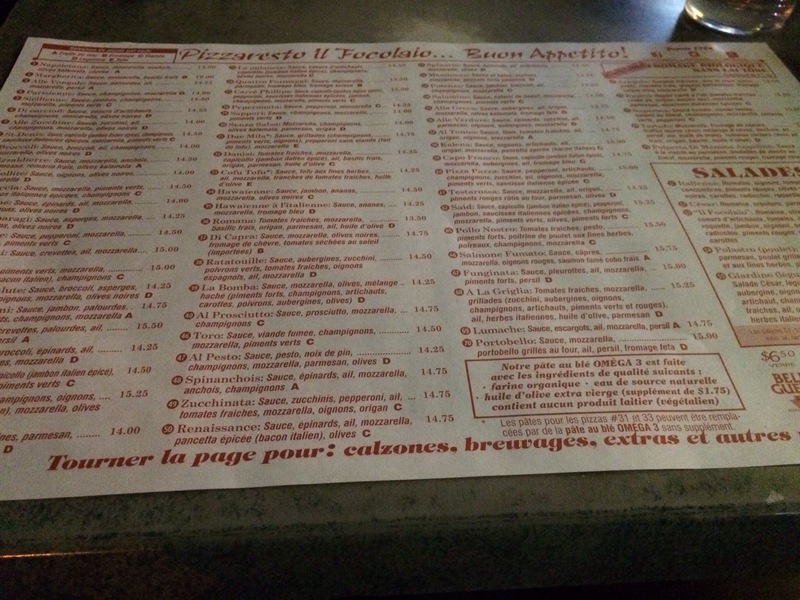 Walking into the restaurant, you absolutely get that old school pizzeria feel – the pictures of celebrities on the walls, all the staff in restaurant t-shirts and caps, paper placemats and the fact that this still only take cash. 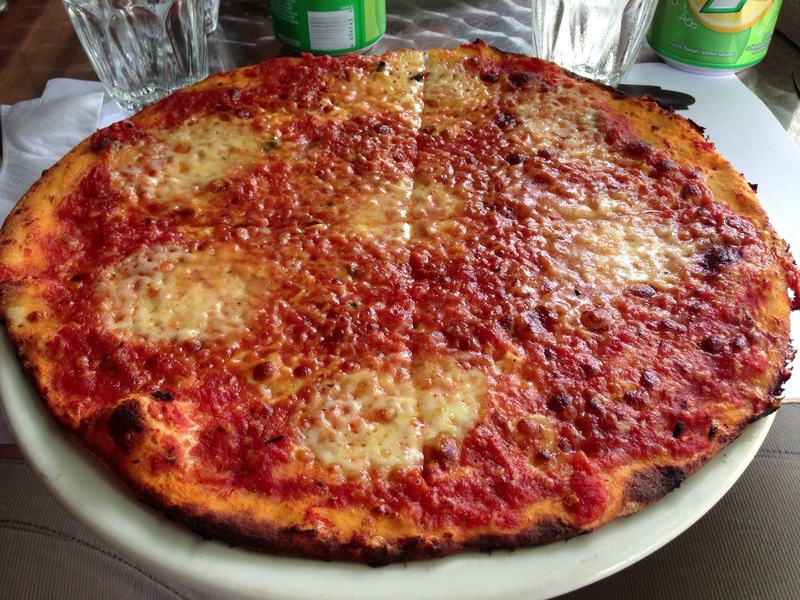 If you’re looking for a classic Napoli style pizza, this is a good place to start.